Yep, I’m headed back to Lincoln City again. This place kinda feels like “home away from home,” I guess. Seems like it anyway. It feels like we’re always close to going there again or just returning from Lincoln City. 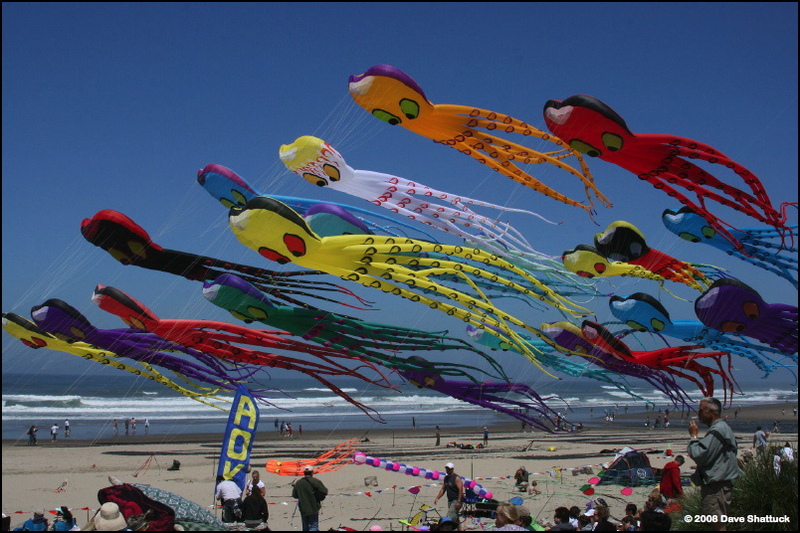 Well, their Kite Festivals are spread throughout the year a bit, but there are enough Lincoln City kite-fests to just make ‘em seem close together. More important, however, is the fact that the city of Lincoln City really gets behind these events! And that’s not just lip service on my part, either. 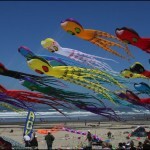 I heard about this Kite Festival on the RADIO in Portland, 100 miles away! Marquees and reader-boards in front of local Lincoln City businesses had “Welcome Kite Fliers” displayed on them when I drove into town, and Tourist Industry business had contributed rooms and meals and made other contributions to this festival. 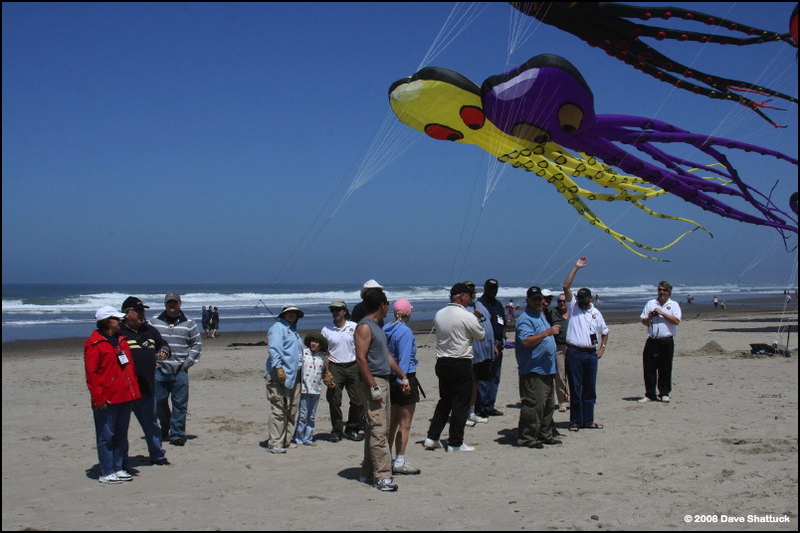 And the Lincoln City Visitor & Convention Bureau, a part of the city’s government, was up front with the financial support too – including travel stipends for the invited fliers, lodging assignments, and support for flying-fields, parking lots, concessions, and vendors for the entire event! Yep – Lincoln City puts their wallet behind this festival too! So, I was late getting on the road – as usual. I’d made arrangements to bunk with Ben D’Antonio, one of the invited fliers, and the General Manager for Revolution Kites. Ben was bringing his Octopus to the party, so I guess I was sleeping with an Octopi! But, since I was late, I ran smack into the predictable traffic coming down to Lincoln City… meaning I was gonna be later still! Well, I had Ben’s cell-phone, so I checked in with him a couple of times. And when it turned out I was going to be REALLY late, he suggested that I just meet him at the Culinary Center on top of City Hall – which is where we finally hooked up. Good! I finally have somewhere to sleep! So, Ben and I headed off to our lodgings – “home” for the weekend – both of us staying at the “Bel-aire Inn And Suites” right on Highway 101 in Little Old Lincoln City! And for the second time since I got there, I was pleasantly amazed! While our lodgings pride themselves on being an “inexpensive” establishment – the amenities available were anything but “cheap.” The rooms were bright and clean and cheery… The public areas were all brushed up nice, and the people behind the desk were pleasant and helpful. I did the “Free Continental Breakfast” in the morning, and found it appetizing, nourishing, and filling! (Enough so that I ate there the next two mornings too.) So – if you happen through that town and need a place to hang your hat for a night or two – the Bel-aire Inn And Suites are certainly worth looking at! 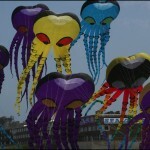 Naturally, the Kite Festival isn’t slated to start “officially” until 10:00 AM on Saturday. Those of us who’ve been there before, however, know that to get a decent parking place, 8:30 is probably the later limit… so we all showed up before 8:30, parked, and then walked over to the Clipper Ship Coffee Company for a… well, a cup of Coffee, of course! Well, most of us did. I went over anyway! Ben D’Antonio, however, did his “usual.” He sent ME for coffee, while he set up his banners, delivered his Octopus to the guys on the beach saying, “I got it here. YOU guys FLY it!,” walked back to his car, grabbed his kite bag, and headed for the beach to “Fly REVS” – which is what he does everywhere he goes… It’s just Ben’s way! About 9:30, when everyone had wandered in, all the “Octo Pilots” gathered in normal mob fashion for a Safety and Strategy” session. David Gomberg – who has some considerable knowledge about both this particular beach (it being his home flying field), and flying “the big stuff” (which is what he does for a living – worldwide!) – gave all and sundry THE WORD about flying safely and what to expect from the crowd we were likely to encounter. All very prophetic words too, because we’d see Dave’s expectations realized over and over again throughout the weekend. Fortunately, there were few if any “incidents” save a few “ruffled feathers” from casual passers-by who naturally wanted us to vacate all our parking spots so they could sit in their cars and view the spectacle. Anyway, introductions all around and safety handled – Dave cut ‘em loose to start digging anchor-pits for sand-anchors… and we were underway! I say we were underway, but that’s not quite true. 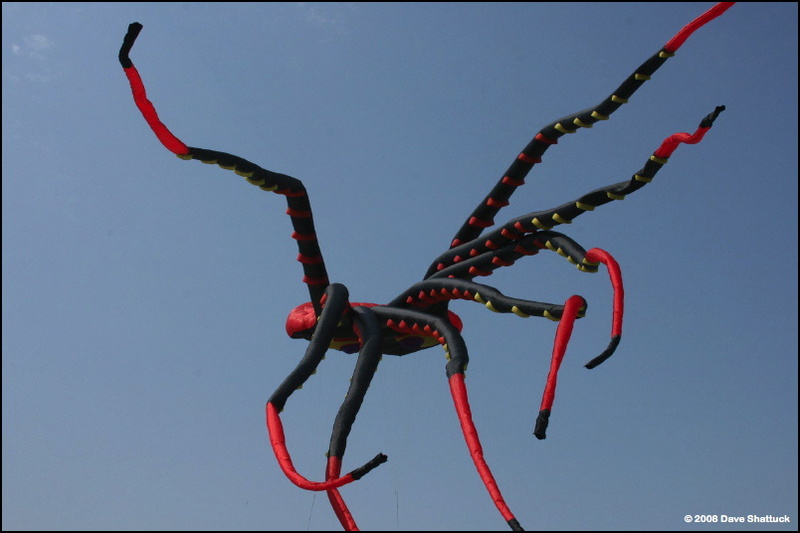 There were two (2) flying fields at the D-River Wayside that weekend – the “Big Stuff Turf,” and “The Demo Field.” Both were roped off with the expectation (well, call it – “hope”) that the public would honor the ropes and avoid the danger of kite-lines and kites. They wouldn’t entirely, but the situation would have been much worse without the City’s efforts in that respect. Anyway, the “Demo” field also had a goodly number of “name” pilots in attendance. Amy Doran and her son Connor were there. Amy would perform her “Charlie Chaplin” routines several times over the weekend. Al “twinkle-toes” Washington and his grandson Aaron would amaze and delight the audience with their solo Dual-Line kite performances. Carl and Lisa Bragiel were also out and about. 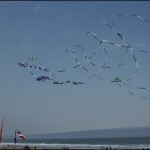 Just watching Carl fly three Shivas from The Kite Shoppe at once is almost a spiritual experience for me. Yes, I’ve seen Ray Bethell – the grand old man of kiting – fly three many times, but for all of Ray’s magical performances, Carl somehow flies his kites in a mystical way that “touches” me somehow. And one cannot watch Penny Lingenfelter and her “cast of thousands,” all under 10 years old – without being delighted by their fun and exuberance. And when practiced and pre-planned routines had run their course, able announcer Bob Wendt would throw some folks together ad hoc, put on a tune he just happened to have ready, and make ‘em perform! And perform they would too! Even Barry Poulter with his iQuad Revolution and Ben D’Antonio with his Barresi Rev 1.5 got roped in, and they performed well for the audience too! 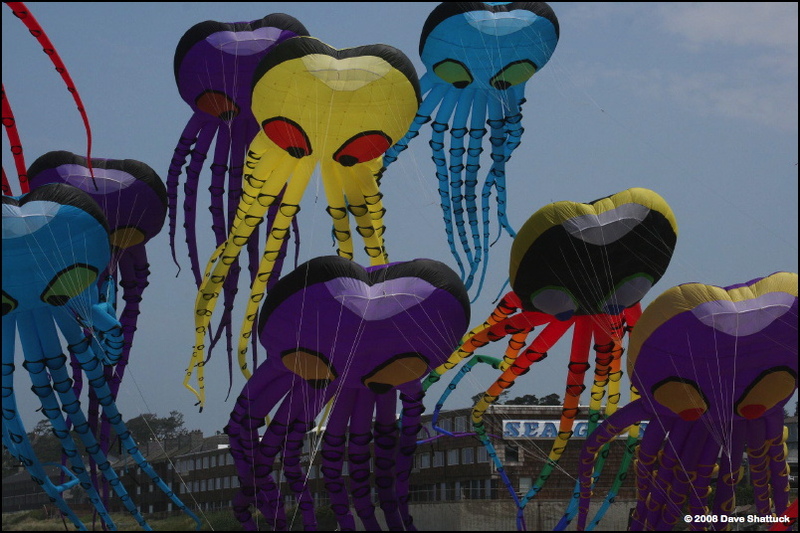 So right along with “The Big Show” – all those OCTOPI – there was an ongoing, ever changing, Sport Kite show as well. And it would continue that way as long as there was interest and there were spectators. And – somehow – the D-River Wayside never seemed to run out of either commodity the whole weekend long. And, come to think of it, with the caliber of fliers on that beach, it’s no wonder the enthusiasm never waned. Several of these pilots have spent their share of time on the National or International competition podiums. Dave and Susan Gomberg – whom you all know, or know of, or just plain SHOULD! Also, these babies aren’t particularly cheap either. 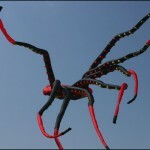 There is no such thing as a “Standard” off-the-shelf Octopus, since they’re all custom made to order by Peter Lynn in New Zealand, and it will cost you roughly $5,000 for a new one. (Though who knows what they cost in a $4.00-per-gallon economy…) Then there’s all the expense of lines and tackle that you have to add into the total. 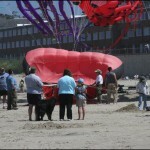 So what we saw on the sands at D-River Wayside on June 28th and 29th, was UPWARDS of $110,000 worth of nylon and other assorted components. And nobody there wants to see that kind of money shredded up in an accident either. Again, please pay attention and stay OUTSIDE of the ropes! 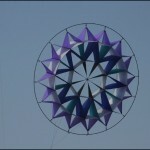 Finally, the weather and the flying field also play a part in any kite enterprise of this magnitude. It turns out that the weather was mostly agreeable for this event, being between 8 and 15 MPH out of the South on both days, but the field certainly left a lot to be desired. Why? Well, there’s roughly 100 yards of usable sand between the wall and the high-tide line. So to be on the safe side, the decision was made early on the first morning that kites would NOT fly over either the water or the walkway fronting the parking lot. 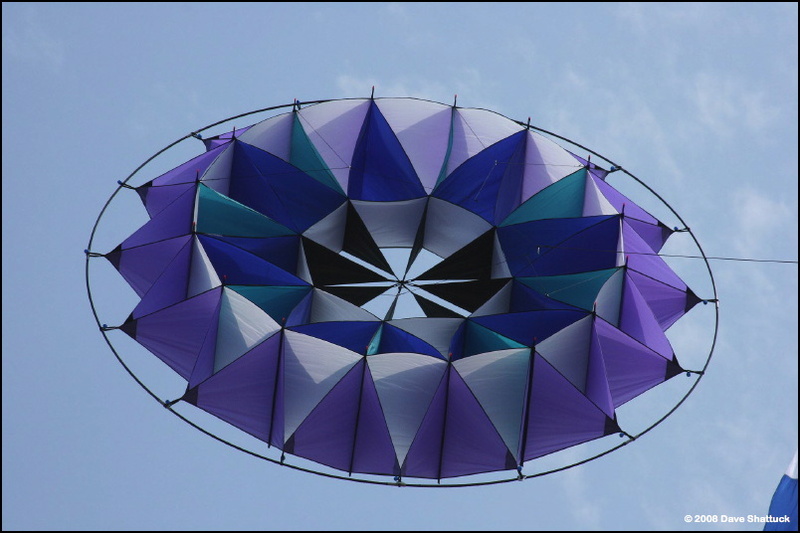 So there’d be adequate free space left on either side, so the public could view these kites easily – but NOT overhead, or in-your-face! 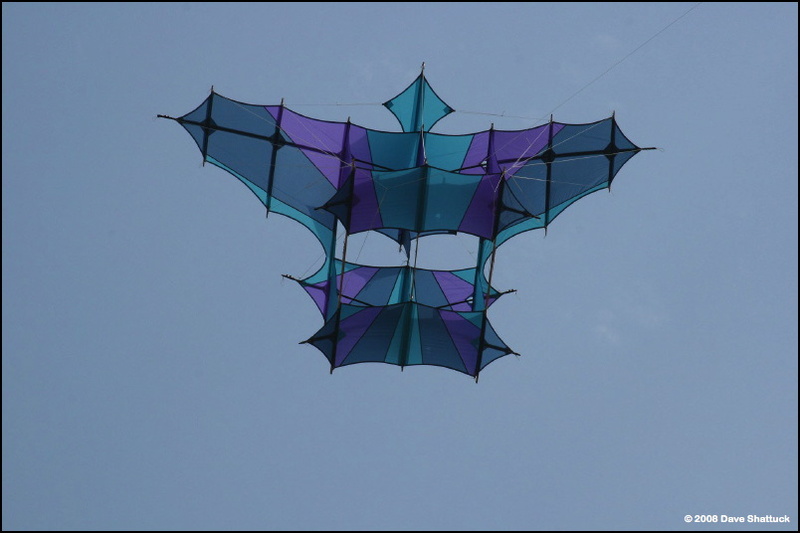 Therefore – to make this thing work – the Big Kite pilots would have to “stack” these puppies… And THAT meant it’d take a good deal of trial-and-error discovery to figure out how all of them could fly together in the same general area. This was not going to be a lay-em-out-and-throw-em-up kinda “picknic!” One at a time, please… Then, just wait a while, and adjust and tune if necessary. 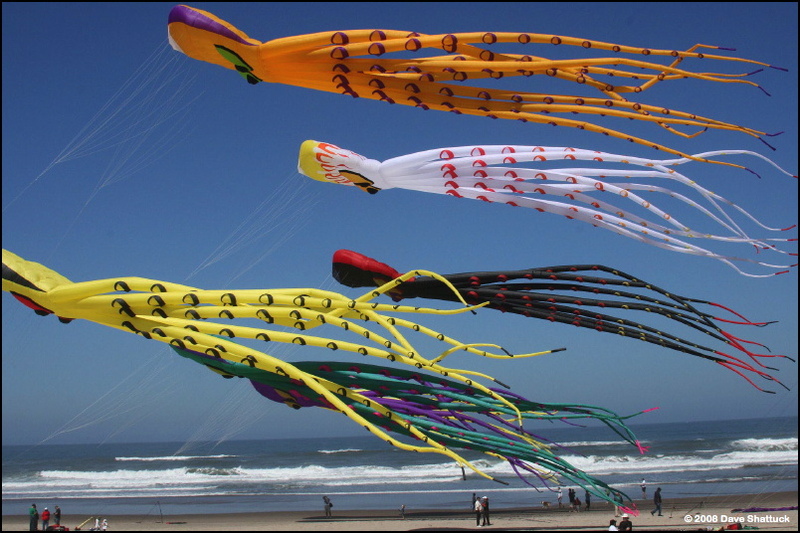 Make sure that every kite has “air.” Make sure that every kite is relatively stable. Then go for the next one… And let us all know when they’re all up, will ya? Yeah… Like THAT! So now you have a rough idea of what these eighteen “Big Stuff” pilots were facing! And, kite-by-kite, they started in. They began by digging huge pits for sand-anchors, and then burying them. There were five main anchors – roughly 50 square feet apiece (another guess), buried 3-4 feet into the sand. 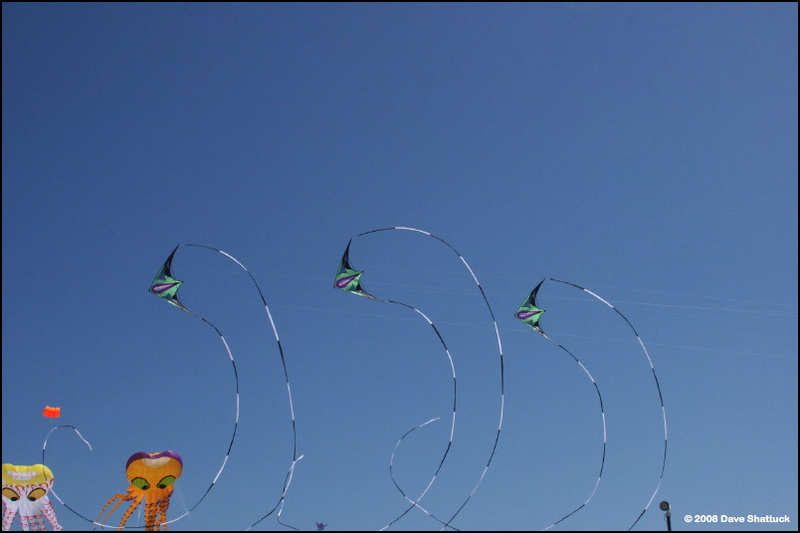 Lines were run between kites and these anchors so that each of the first kites flew from two fly-lines. 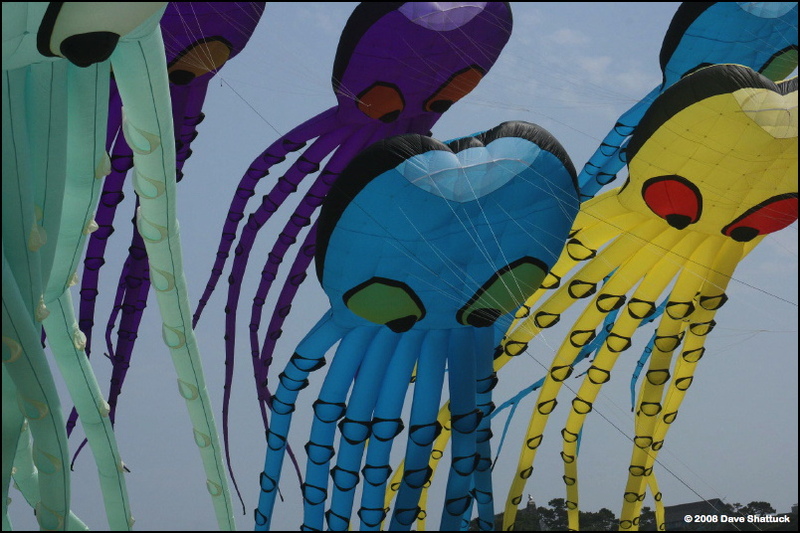 “Pilot kites” pulled some of the first Octos aloft, and then the kites aloft were used to pull other kites aloft if it was necessary… And the owners/pilots flew kites, adjusted kites, tuned kites, and “tweaked” kites… And they waited, and stabilized. And they waited some more. Then they un-buried an anchor, moved it twenty feet, and re-buried it again. Then tuned, and tweaked, and adjusted again. If you had a chance to stand on the sidelines and watch all of this, it was either very maddening or quite fascinating – take your pick! 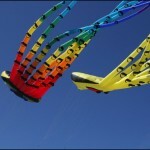 If you were frustrated by the slow pace of kites going into the air, too bad for you. You missed the REAL show! — This wasn’t science! 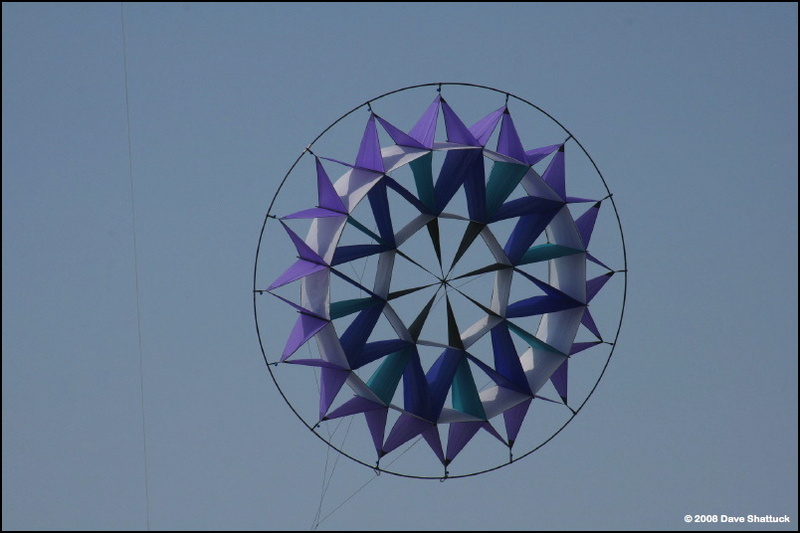 This was really Kite “art” happening before your eyes. — These pilots constantly had to take wind-shifts and turbulence into account. 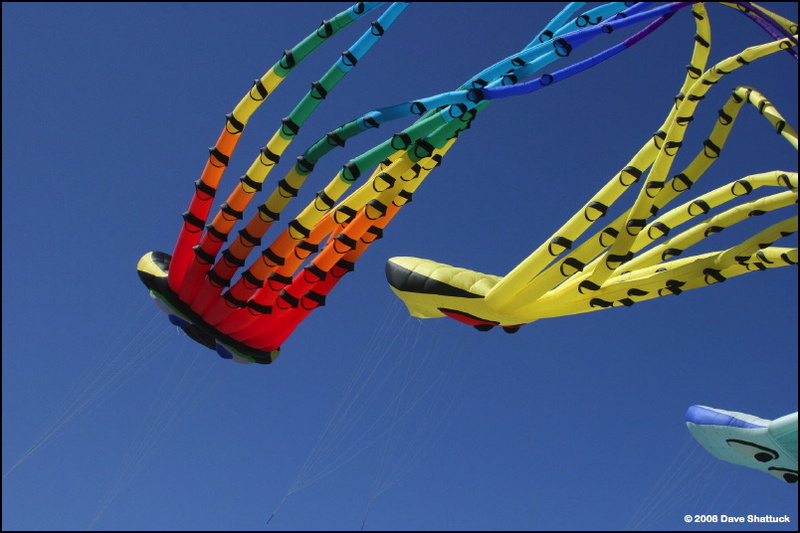 — Kites down-wind of other kites suddenly “lost” air, and fell to the ground. 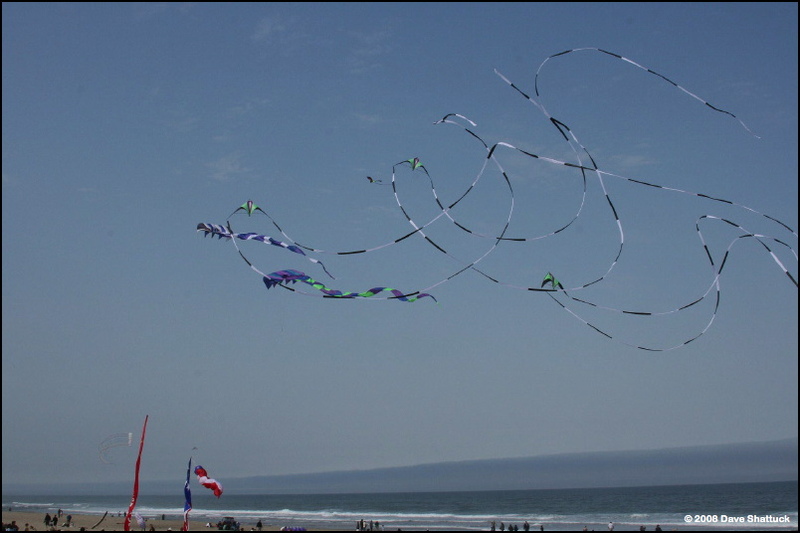 — When that happened, one falling kite could drag 3-4 other kites down with it. — Then there’d be a half dozen guys out there sorting lines and pulling nylon apart. — Then they’d make adjustments – and try again! Re-launch! …and so the pilots slowly added another three. Then they sat like that for another ten or fifteen minutes – tweaking, tuning, adjusting here and there. But mostly just watching, calculating, judging, deciding… Where can we put the others in the air – WITHOUT causing another mass cluster-crash? 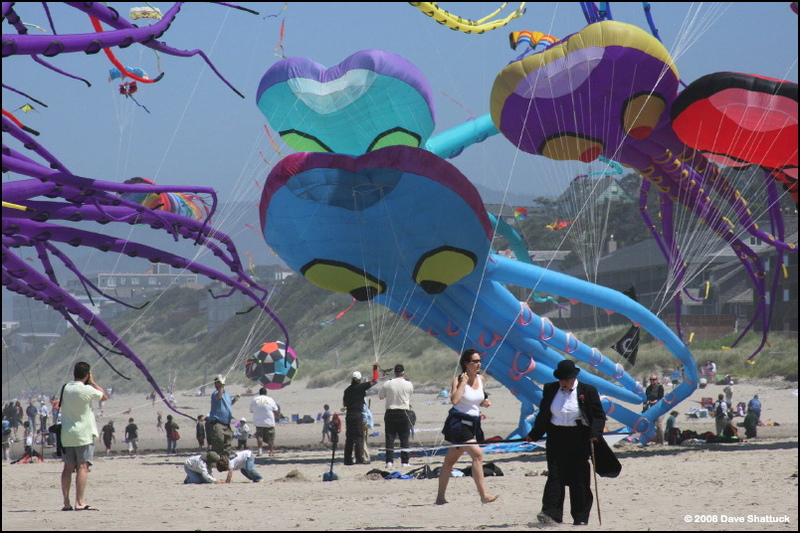 “May I direct your eyes to the Big Kite field once again, where our pilots NOW have eighteen Octopusses airborne,” says Mr. Wendt into the microphone. Oh, heck – LET’S GO FOR IT! 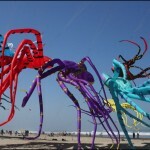 The last Octopus into the air was a big red one – and suddenly, EVERYBODY knew what was about to happen. Then the pilots finally had TWENTY-ONE OCTOPI IN THE AIR! Bob Wendt tried to inform the audience of what had finally happened, but the roar from the crowd overshadowed his comments. The public had watched this event for themselves! And let’s let them settle in… Maybe a little more adjusting, but don’t mess around too much. 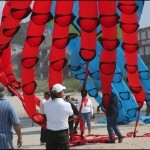 Don’t upset the delicate “balance” of all these HUGE kites in the air! 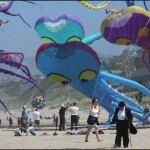 Yep – a new World Record for the number of Giant Airborne Inflated Octopi Flown Simultaneously! (G.A.I.O.F.S.?) All smiles, nobody hurt, all exactly as planned! There was a smallish party upwind on the beach for a few minutes. Photos of pilots for about a gazillion folks with cameras… Hugs and handshakes – yeah, of course! Nice Job! Congratulations to YOU too, my friend! 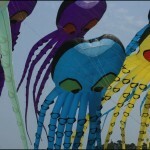 And after a while… the big kites all rode the air just fine! 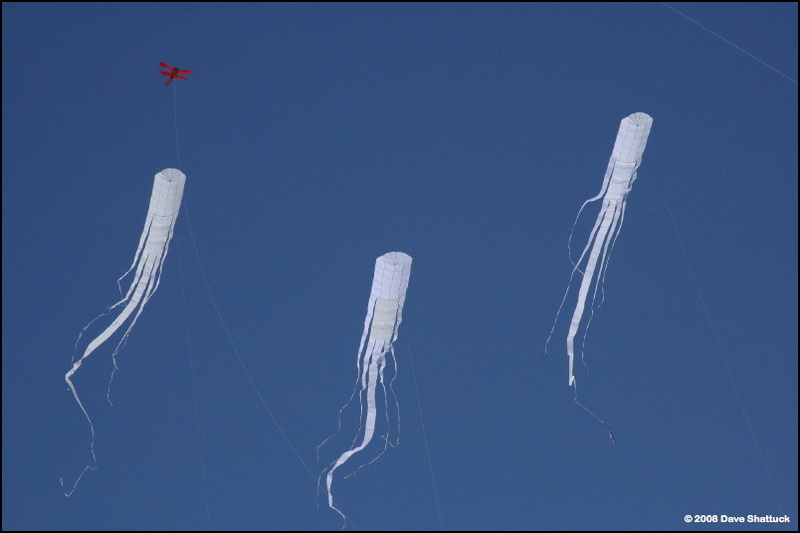 Oh, one or two touched the ground a time or two during the afternoon, but there was always someone ready to give a small tug on the proper line to nurse the recalcitrant Octopus back into its “proper” place – airborne, and flying free very nicely, thank you very much! Proud? Yessireee… But we’ll remain vigilant, thanks! Too much nylon up there to ever completely walk away and just forget about it! And so that’s how they spent the rest of the afternoon, too! Resting – smiling a lot – but with an eye aloft! Well, while all this was going on, what had I been doing? Oh, I had my usual “chores” from the get-go. I wandered through the crowd. I found out where they’d stowed the fresh coffe, and sampled a bit – just for “public safety” reasons, you understand. Hunted up Maggie Conrad and thanked her profusely for the very nice, though unexpected room. I watched each of the Demo performers strut their stuff at least once, and I could be wrong but I think I saw them all fly demos several times – excepting only Barry Poulter and Ben D’Antonio. I’m not certain that either of them hit the Demo field more than once, however. And I ate a hotdog purchased from the food booth. 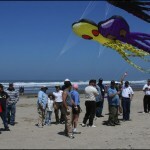 And I schmoozed with the crowd and took a few photos, though mostly of kites rather than people. 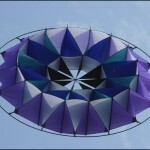 One of the “local kite celebrities” happened by, so I shot a few photos of Rick Brown’s newest (and prettiest?) Cody flying very well… Barry Poulter and his wife Kim had waded the “D-River” to go fly Revs over on the north side, in front of the Sea Gypsy motel. Barry had also put three of his 50’ “Meteors” into the air, and I took a couple of shots of them, too (since I own one). I happened to be up on the sidewalk overlooking the beach when Carl Bragiel flew three Shivas with 100’ tube-tails tied on the wingtips, to some Irish lass singing “Danny Boy.” Carl flew so smoothly and so gracefully… and so “one” with the music – that it took my breath away and literally brought tears to my eyes. After it was over, I went out to Carl to thank him and tell him what he’d done to and for me… We shared a big hug, and I told him, “You NEVER quit this, Carl! I can’t put into words what I feel you’re doing, but it’s really VERY special! You’re doing things with kites that nobody else is doing!” Carl got this big grin on his face, and thanked me… as did Lisa, Carl’s wife. Anyway, as the sun headed down toward the horizon and the air began to chill a bit, the breeze began to taper off too. 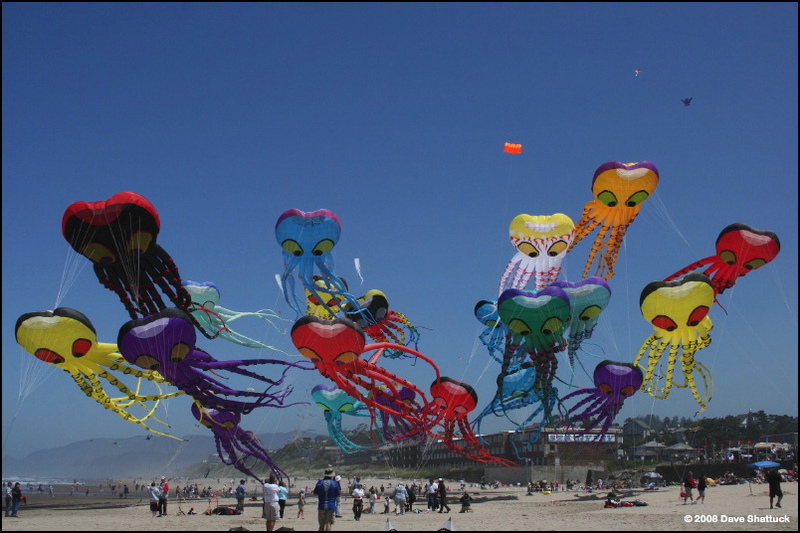 So finally, one by one, the big kites began to drift to the sand, to be rolled up or stuffed into duffel bags, waiting to fly again on another day. And as the sun hit the horizon, the beach was empty of everything but a little refuse and a whole bunch of footprints. I don’t rightly remember what I did for dinner on Saturday night. I will readily admit, however, that I was certainly tired – done in by all that walking, all that fresh ocean air, and all that fine excitement! I may have eaten dinner by myself, or with Ben D’Antonio. But I might have just gone back to the motel and climbed into bed too. Whatever happened, I certainly slept well. Sunday was a one-for-one repeat of Saturday. Well, “almost” anyway… The beach was the same, and so was the weather – including the winds. Everyone who was there yesterday was there again today. About the only change was – the pressure of hunting for a World Record was missing. 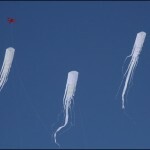 Sure… There were Octopi in the skies at the D-River Wayside. Yes, Bob Wendt held the mike in the Sound Booth. And the invited Demo fliers covered the sands with their usual antics and demonstrations of skill. People ate, drank, wandered on the beach, let their kids run wild, and Oooo-ed and Ahhhh-ed at the pretty Octopi in the skies. Ben D’Antonio flew Revolution kites all day – and I wandered hither and yon, yakking with whoever might share a word with me. Among other folks, I happened to run into Mr. Barry Ogletree… who I’d probably met on Friday night, but we shared a few words on the beach. He was interested in his big “OLO” – standing for Over Large Octopus! 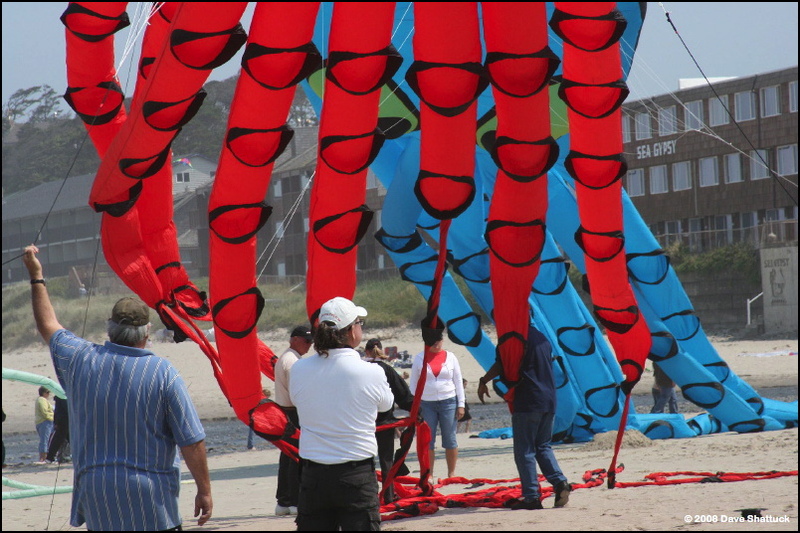 Barry really owned “The Biggest Kite On the Beach.” While the length of a “Standard” Peter Lynn Octopus is 90 feet, Barry has a black one he calls “Wiggy” that measures 120 feet instead, and he wanted to know if I had any shots of his kite in the sky yesterday in my camera. Well, I would have about 400-500 shots by the time the weekend was over – most of ‘em taken on Saturday. Yeah, I’d be sure he got the best photos of “Wiggy” that I had. So, when I was selecting shots for this article, I made sure I put the best one of “Wiggy” in, and he – and all the other Octo pilots – got copies of all the selected photos for this event report, too. I also ran into Jerimy Colbert, flying his hand-made Codys. I didn’t see his boys, though I don’t think I’ve ever run into him with out at least one in attendance, so I must have just missed them. Anyway, Jerimy is a special guy and one of the nicest, most “selfless” people I’ve ever met, and he really knows his kites too. He’s a “local” from the Lincoln City area, so it’s always my pleasure to run into him when I’m down there. 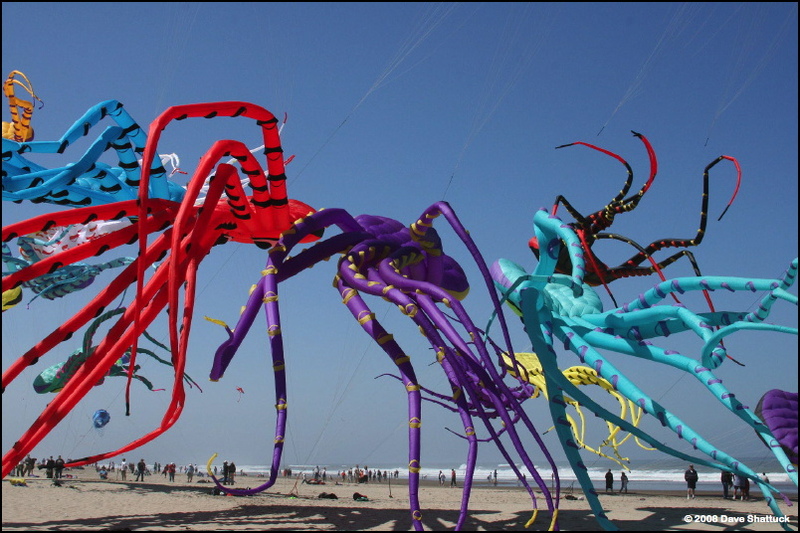 Anyway, Doug had a new kite in the air – a cellular he’d built, and he figured that this D-River beach would suffice for a test-flight. So I unstrapped the camera and banged a couple of shots off. Pretty kite, and it’s darned stable in the air too! And though I didn’t know it at the time, I’d see him on the beach on Monday, when he’d fly his big 45’ hand-made patchwork delta. 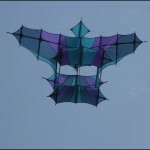 That’s also a lovely kite to see in the air, but he didn’t have it with him on Sunday. And, before I knew it, I began to experience some of that old post-festival “let-down” too. 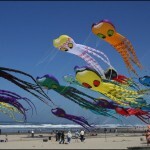 This twenty-forth Lincoln City Summer Kite Festival was coming to an end – whether I liked it or not. 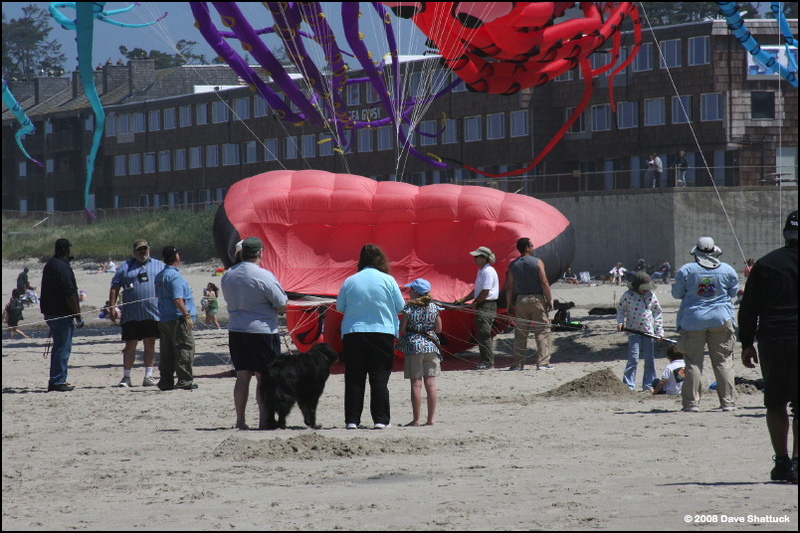 And, as I was wandering around, wondering where all the people had gone, down to the beach came Lindsey Johnson and Ronda Brewer, another pair of “local” kite fliers. Lindsey makes at least part of a living producing kite paraphernalia and kite-kits, and Ronda’s a real “trooper” in the kite community of Oregon and in the AKA too. Ronda and Lindsey have a rather nice way to combat that post-festival let-down I was mentioning up above. 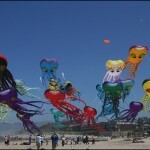 When a festival’s over – they go fly kites! So I hung around a bit and sorta “helped” them combat those post-fest blues… and ya-know – flying kites kind of helped me over that hump, too! But after a while, it was time for me to hit the beach as well. After all – I had a “party to attend, so it was back to that very nice Bel-aire Inn for a quick shower and a shirt change. Then it was off to “The Beach House” with Ben D’Antonio to attend our gathering! So… Barry decided to host a small get together for all the Big Stuff pilots, and I was invited, as was Ben D’Antonio – so we went! Nice folks. We mingled, roamed, ate a few canapés and salmon-cakes. I had a glass of very nice Merlot, and Ben did his normal coffee bit… I think I probably said hello to everyone there by the time the evening was over – including the restaurant owner! Anyway, we did all right, stayed a couple of hours, and then headed back to the Bel-aire Inn again for a stint watching some movie on the tube, followed by a good, healthy rest again. Next morning, Ben decides early on that he needs to abandon any thoughts of going to the beach and just start his trek back to San Diego (a whopping long drive to make solo, brother), and I didn’t blame him one bit. It’s a bit overcast this morning, but I had a date at the D-River Wayside again. So I rolled on back to a very empty D-River Wayside once again, where I’d planned to meet Phil and Barb Burks. Yes, they were there all right, and were intent on flying a couple of Dualies as a “pair,” so I let them play a little bit. Doug and Linda LaRock were also there, and Doug was thinking about assembling and flying the hand-made 45’ patchwork Delta. So we yakked for a little while and then I readily agreed to be tutored by the master if he’d give me “Delta” instruction, and Phil and Barb said they’d come and help too. Well, even though it’s always a mite sad, I reach a point where the thought of my own bed, and my own shower, and a home-cooked meal – even if it’s only plain old spaghetti – sounds pretty fine to me. 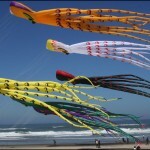 So I headed over to the kite van, gave a friendly wave to good friends Phil and Barb, and headed off for Vancouver, WA. And about two and a half hours later, I rolled to a stop in front of the house – quite happy to be home again. 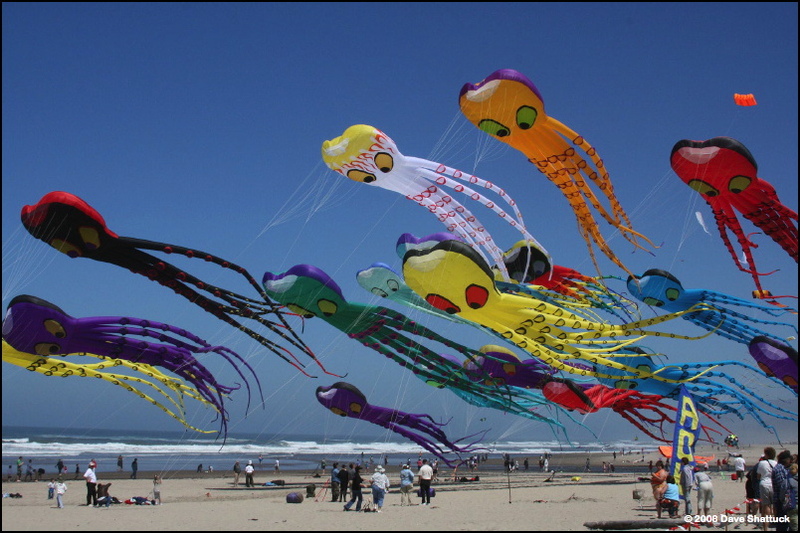 Yeah, the folks at Lincoln City put on one dandy Summer Kite Festival this year, but nice as it was – home always feels pretty darned fine! See ya all there next year… I’ll meet you on the beach at the D-River Wayside! This entry was posted in 2008, Issue 61 (Jul/Aug), KL Archive and tagged festival, lincoln city, octopus.